Conal Gallen at the Royal Theatre, Castlebar, on 6th Feb 2010. Conal Gallen is without doubt, one of the funniest people you will ever meet. Having travelled the world making people laugh, he is back with his hilarious show at the Royal Theatre, Castlebar in January. 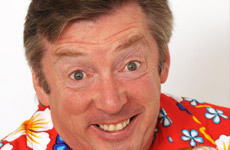 Described as "Ireland's Funniest Man In Ireland's Funniest Show", it's easy to see why – with his hilarious singles "Horse It Into Ya, Cynthia" and “Holiday in the Sun” along with his witty humour, Conal certainly has the knack! Laughter is easily the best medicine, and judging by some of the songs in Conal's shows everyone in the audience should be cured by the end of the evening!